Elliott Homes took home multiple awards at the 2018 Best in Mississippi Housing & Remodeling Awards Banquet, held annually to recognize the outstanding work of builders and remodelers throughout the state. “We remain true to our objective of creating quality of life for our homebuyers. 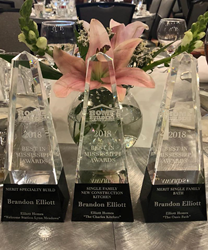 These awards are a confirmation of our collective efforts as a team to be the best in the industry and we are thankful to continue to be recognized by our peers in home building,” said Owner, Brandon Elliott. Elliott Homes took home multiple awards at the 2018 Best in Mississippi Housing & Remodeling Awards Banquet, held annually to recognize the outstanding work of builders and remodelers throughout the state. The Home Builders Association of Mississippi (HBAM) hosted the award banquet November 7th at the Embassy Suites in Ridgeland, MS. Selected projects demonstrate the best overall style, craftsmanship, and creativity. The award letter received from the Home Builders Association of Mississippi highlighted that Elliott Homes “exemplified the excellent work that members are producing across the state.” Elliott Homes was recognized and awarded in three categories: Best Single Family Kitchen – The Charles, Merit Specialty Build – Welcome Station Lynn Meadows, Merit Single Family Bath – The Oasis Bath. Elliott Homes, one of the Mississippi Coast’s most sought-after home builders, specializes in distinctive award-winning homes and master-planned communities. What distinguishes Elliott Homes is our exceptional customer service. Our professionals, many of them Elliott Home owners themselves, are passionate about ensuring a seamless and rewarding home building process. At Elliott Homes, we believe home design is more than a blueprint—it’s about realizing the lifestyle our customers dream about. Unlike other builders, Elliott Homes start in the low $200s and include impressive upgrades standard.